This system is the brainchild of a man named Raymond Royal Rife. These machines can emit audio, light or radio frequencies. The Rife equipment here is of all three types and it is believed to be the biggest Rife centre in the southern hemisphere. Brilin began by using two Rife machines and it was originally called a Rife Research Centre but today the systems we have are the very best top-of-the-line we can possibly obtain. For our resonant light technology we use PERL systems, on our sound tubes we use two powerful MOPA amplifiers and our Radio Frequency work is done using the GB4000 systems. Our equipment has also been regularly updated with the latest improvements. 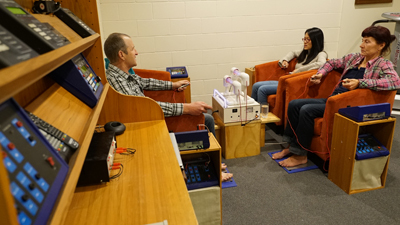 Orthodox medicine does not allow the use of Rife gear but it has been reported that some doctors have seen the brainpower behind Rife and at the Christchurch Hospital there is apparently a Rife system hidden in a back room. There are many types of modern day Rife machines but they all work on the same principle of sympathetic resonance, that is to say that if one system vibrates, then another nearby will vibrate in the same way even if they are not touching. In exactly this way a sound wave can induce resonance in a crystal glass and can even shatter it. Interestingly the principle has found its way into official medicine in the ultra-sound treatments used to break up kidney stones. 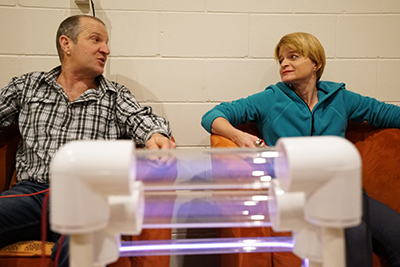 We use Rife machines to physically vibrate offending bacteria, viruses and parasites. The light, sound and radio waves are carrier waves for the vital resonations that do this job. The object is their destruction and elimination from the body by sympathetic resonance. Some of our Rife frequencies are standardised and already in the machines. Some of our Rife frequencies are customised readings taken from Iboscans using the Asyra system and we program them into our Rife equipment. We have found over the years that the standardised readings are just as important as the customised readings that are changed every month or so. In many cases we suggest using the Rife equipment for about 3 months but this opinion needs to be set alongside the view that is also prevalent in the Brilin community, that it is a much longer term strategy. Above all, personal belief in the direction taken is absolutely vital. When using the Rife equipment . . .
* Relax and let the equipment work for you without any need for any anxiety about it effectiveness. * Visualise disintegration of the bad micro-organisms and feel contented this process is under way. * Think of your blood being cleaned and remember that the very life of your flesh is in the blood. * Only use the muti-wave oscillators on days not used for Rife work. * Drink plenty to water. It is easy enough to ‘press 5’ to pause the system when going to the toilet. * Respect conversational limitations or maybe the relative reticence others may seek. * Plan a little for your Rife sessions: a book to read or earphoned music?